Watching your little one crawl, scoot and ultimately take his/her first steps is one of the best moments of being a parent. However, once your baby is mobile, it can get exponentially difficult to keep an eye on him/her that you have grown accustomed to. I remember when my daughter started crawling; I had such a tough time keeping tabs on her. All she wanted to do was crawl and scoot- all day long! As cute and adorable as it was, I just couldn't keep up. I couldn't leave her alone for a second, or she will try to crawl over everything in his path! Playard is a rectangular 'baby container'! Playards have a metal frame and fabric walls that can be retracted for easy storage and transportation. They are designed to be like a small room for your child where he/she can play with all the toys without the need to be actively monitored. You can leave your baby in a playard and get some work done without having to worry about him/her getting in dangerous situations constantly. Most of the playards on the market have a ton of attachments to keep your baby busy as well. Some of them even have a detachable bassinet so that they can be used by older babies and even toddlers. Some of the best playpens also have a great selection of toys, place to hold diapers and other baby supplies and even a set of wheels so you can take them to any room in your house. Why do you need a playard? And if you are wondering what can you do with it once your child outgrows it, a playpen can be turned into a beautiful toy basket! As with any other baby product, the safety and comfort are the priority while selecting a playard. You want the playard to be as safe and comfortable for your child as possible. Many features can have an enormous impact on both the safety and comfort of a playard. If you are aware of all these features, choosing the best playard can get a bit easy. Here are some of the features that you should be looking for when selecting a playard for your baby. Quality material and a solid build quality go a long way in determining the safety and comfort of your child in a playard. Make sure that the metal frame of the playard is made with a high-quality metal that can withstand the weight of the baby and won't buckle down during transportation. There are a ton of playards out there that are cheaply made with inferior framed that bend and break far too easily. Make sure that all the components fit into each other perfectly and there is no squeak or give when a playard is completely assembled. Another thing to look for is the fabric used in the construction. Make sure that the fabric is comfortable to touch and hypoallergenic. There will always be some plastic components used in the playpen, make sure that the plastic used is BPA, phthalate, and benzene-free. Trust me, as you will see, some great options on the market meet all of these criteria. One of the key things to look for in a playpen apart from the build quality is the ease of transportation. Make sure that you are selecting a playard that is light and easy to fold and carry with you. If it is too cumbersome and bulky, it will be of no use whatsoever. Another thing to look for is the folding procedure. You want to be able to fold this thing in minimum steps. Make sure that the design is elegant that allows you to fold and unfold a playard in minimum steps without the need of any tools whatsoever. Having a set of wheels is a great feature to have in a playard. The type of wheels that are used also matters a lot. Make sure that if you are getting a playard with a set of wheels, they large and lockable. Larger wheels are easy to track on a carpeted floor. You also want the wheels to be lockable. Once you have the playard in place, you should be able to secure it by locking the wheels in place so that it does not move. Babies can be quite active in the playard, and you don't want the playard to move when your baby is in it. If your baby is not entertained in the playard, the whole purpose of the device will be moot! Thankfully, most playards have a ton of toys and audio-visual stimuli to keep your baby entertained and busy. Also, if you opt for audio or light making toys, keep in mind that they will need batteries as well. Some of the best playpens also have arches and other places where you can have your baby's favorite toys hanging. Make sure that you are not picking a playpen just based on the extra features. But some additional features can be great to have. For instance, if the playard has a place to store extra baby food or diapers, it is a great selling point. However, keep in mind that these additional features may come at a premium. So, if you don't plan on using any of these additional features, it does not make any sense to pay extra just have them there. So, as long as you pay attention to these features, you are sure to find a playard that is safe, comfortable and affordable. Your baby will love it and so will you! Now, before we go ahead and check the top 5 playards that you can buy, there is one more thing that I wanted to touch upon, and that is safety. Safety is paramount and non-negotiable. You are purchasing a playard to make your life easy, not complicate it, right? Although playards are very safe, there are a few precautions that you might want to take while using them. Here are some tips that can make playard time fun as well as safe. Make sure that you are setting up a playard away from doors or windows. There is always a chance of someone barging in and accidentally knocking them over. Although a playard is very safe for your baby, it is not a very good idea to keep the baby unattended for extended periods of time. Remember, a playard is not a babysitter. You can get a few things done around the house while the baby is in the playard, but make sure that you are not too far away from the playard. Keep tabs on loose strings and other things in the playard. Make sure that you are cleaning the playard after each use and if there is some accident like a diaper leak. Also, make sure that you inspect the playard every time you set it up. Make sure that you are checking for any tears in the fabric, or bend in the metal frame. Another most important thing is to make sure that you are not giving your child big toys that he/she can use as a stepping stool to get out of the playpen. It is particularly important if your child is very active and has learned to step over. Now, with all the things taken care of, let's take a look at some of the best playards that you can buy. Graco is one of the biggest names when it comes to cribs and playpens. They have some playards on the market. The name 'Pack 'N Play' is so popular that many people refer to playards in general by this name! While there is no doubt that Graco makes some of the best playpens on the market, their best product is the Pack 'N Play with Reversible Napper and Changer. It is one of the most versatile playard in the market that, as you can guess, change into a changing station. One of the best things about this model is that it is designed with a growing child in mind. 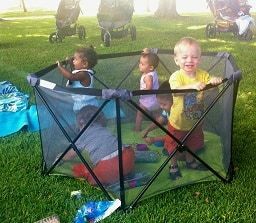 You can use this playpen for an infant or even a toddler. The playard also comes with a station containing a detachable bassinet. The build quality of this playpen is exceptional. It is made from some of the best fabric material and the metal used in the frames is also sturdy and reinforced to withstand heavy usage. Another thing that I love about this playard is the fact that it has a beautiful arch to hand all your baby's favorite toys. Overall, this is a fantastic playard, that checks all the boxes. And the best thing is, it is light on the budget as well! If you are looking for a spacious playard that is incredibly easy to fold and carry, then the Summer Infant Pop N' Play is a playard for you. It is one of the best moderately sized playards on the market. It is a free-standing playard that can be used both indoors and outdoors as well. One of the best features of this playard is the ease of use. I have used some of the larger playpens for my daughter, and I can tell you that some of these playards can be a real pain in the neck to set up and use. However, the Pop N' Play is one of the easiest playpens that I have ever set up. The build quality of this playpen is also top-notch. With a total area of 14 square foot, your baby will have all the space he/she needs to play comfortably in this playard. The playard is designed in a hexagonal shape for added safety and structural integrity. 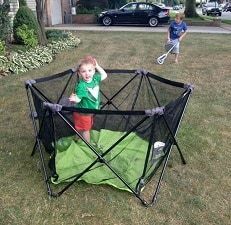 The mesh side walls allow for easy monitoring of the kids, and the lightweight design makes it a breeze to carry it around. 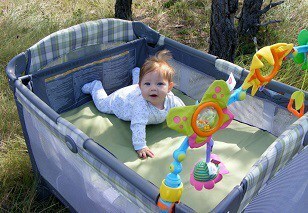 I have taken this playpen to parks and beaches, and it performs just great. The floor is made from water resistant canvas for easy cleaning and durability. If you are looking for a playpen that is minimalistic in design but easy to carry and set up, then look no further. As the design of this playpen is minimalistic, there are no toys or even a mattress in the playard. That said, it does a great job of keeping your child safe and protected. When it comes to baby products, Fisher-Price is synonymous with quality. They have successfully amalgamated quality and affordability; thousands of successful products bear witness to that fact. So, naturally, when I came across a playpen from Fisher-Price, I had quite the expectations. It should come as no surprise that the Ultra-Lite Day and Night playpen met all my expectations. It is an excellent three-in-one play pen that can be used not only as a playard but as an inclined sleeper and a diaper changing station as well. One of the best things about this playard is that it has a removable inclined sleeper that you can use without the playpen as well.There is a nice head support with the inclined sleeper as well. The construction of the playpen itself is quite solid as well. The walls are made from hypoallergenic mesh fabric that allows monitoring the baby in the playard. The floor of the playard is covered with a vinyl liner that is easy to clean after a mess. The playard mattress is comfortably padded, and your baby can use it for some napping as well. If you are looking for a playard that offers you more versatility, then Fisher-Price Night and Day is a playpen for you. The Baby Trend Deluxe is a versatile playard that is designed to be much more than a playpen. It is loaded with features that you have come to expect from a modern, sleek playard. One of the best features of this playard is a full bassinet with a canopy. The bassinet can be detached with easy, and you can use it without the playard without a problem. I also love the fact that there is a ton of space in the playard to store diapers, toys and other stuff. If your baby needs a quick change, the Trend Deluxe has you covered as well. Just flip the changing table in place and boom, you got yourself a full blown changing station. It is one of the few baby playpens that has a music center to keep your baby entertained. There is also plenty of space for hanging toys as well. As far as the construction is concerned, there are no problems there, either. The metal frame is sturdy, and the fabric is hypoallergenic and easy to clean. If you are looking for a beautiful playard, then Baby Trend Deluxe deserves your consideration. If you are not on a budget and want the best quality playard, then the 4moms Breeze is a perfect fit. The best feature of this sturdy playard is the design. It features a unique design that is by far, the most innovative regarding ease of use and safety. It is made from a composite material of 78% polyurethane foam and 22% polyester, and there are no corners cut as far as quality is concerned. The minimalistic design allows for a safe and comfortable space for your child to play and take naps. Although there is no mattress in the playpen, the bottom is quite comfortable and can house a mattress, if you have a spare one. However, a mattress is not needed at all. The design of this playard is something that is worth mentioning over and over again. To assemble the playpen, all you need to do is place the playpen on a flat surface and push down on the center. That's it; it is as simple as that. All the components fit right into each other without a problem. When your baby is done playing, it is equally easy to fold back up as well. Although the playpen is the most expensive on the list, it is certainly one of the best both regarding quality and ease of use. Playards are some of the best equipment that you can buy for your baby. They are versatile and keep your baby safe while you can get some work done around the house. After reviewing some of the best playpens on the market, the ﻿﻿Graco ﻿﻿Pack 'N Play Playard with Reversible Napper and Changer outshines the competition. The Pack N' Play is versatile, comfortable and easy to use as well. It features all the features that you expect from a playard. The quality is impeccable, and the price is competitive. If you are looking for a playpen, the Graco Pack 'N Play Playard with Reversible Napper and Changer is your best option. That said, all the five products reviewed above can make excellent choices as well. If you found this article helpful, please share it with your friends and family. 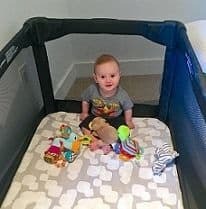 Health & Parenting: Does My Baby Really Need a Playpen?